Indians Baseball Cards: "Hip Hip Hooray!" As you can imagine, I was curious to see what was inside! 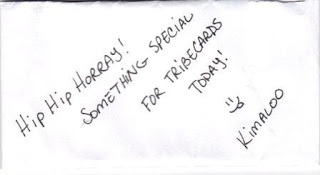 A few short days ago, I made a comment on Kimaloo's Cards regarding her cool A-Rod sketch card (here). For the record, "Kimaloo" has been in my 'clubhouse' for quite a while, but for some reason it quit SHOWING UP in the clubhouse list. I took it out and added it back in and now it shows up again. Weird. Yeah, that's right, a 1/1 Kimaloo Jim Thome "Thomenator" sketch card!!!! How friggin' awesome is THAT!?!? Thank You, Kimaloo!!! Seriously, this is so freakin cool! I have no idea what you do for a living, but artistry should certainly be part of it!! Now, I have to come up something the even remotely comes close.... I may be searching for quite some time! To see the sketches on her site is one thing, but to hold one in your hand and simply marvel at the detail work is a whole other level of experience! The likeness alone is awesome, but add to it the shading, shadowing... The sheer excellence of this hand-crafted work of art is beyond anything I would have ever guessed I would see. I know I'm gushing like a school-girl here, but DAWG, GIRL, YOU ROCK! This card will be placed along side another work of great "card artististry" that I received from Lucy some time ago. The "Thomenator" has its own special place of high honor! This is beyond any "mojo!" Pure-Dee Awesomeness.